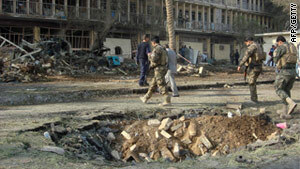 Iraq has been rocked by a series of deadly suicide bomb blasts in recent days. Baghdad (CNN) -- At least 32 people were killed and 150 others wounded in two explosions targeting Shiite pilgrims Thursday in Karbala, about 60 miles (100 km) south of Baghdad, police officials said. It was the latest of several terrorist attacks across Iraq this week that have killed at least 118 people and wounded 450 others. The attack in Karbala came as tens of thousands of Shiite pilgrims are making their way to the city for Arbaeen, a religious observation. It follows 40 days of mourning for Imam Hussein, a grandson of the Prophet Mohammed who was felled in a 7th century battle in the Iraqi city. Another attack Thursday also targeted Shiite pilgrims: one pilgrim was killed and nine other people were wounded by a roadside bomb in southern Baghdad as they made their way to Karbala. On Tuesday, five Shiite pilgrims were wounded in an attack in Taji, just north of Baghdad. Meanwhile, in a separate attack Thursday, a suicide car bomb targeting a police checkpoint in Baquba killed at least four people and wounded 33 others, police officials said. Two of the dead and nine of the wounded were police officers, according to authorities, who said the attack bears the hallmarks of al Qaeda in Iraq. A suicide bomber rammed a minibus loaded with explosives into the main gate at Diyala police headquarters in central Baquba. The headquarters was preparing an exhibition of weapons and ammunition confiscated by Iraqi security forces from insurgents in 2010. On Wednesday, suicide bombers hit a pair of locations in Diyala province, killing at least 16 people and wounding nearly 100 others, authorities said. A suicide bombing that targeted a recruitment center in Tikrit on Tuesday killed 65 and wounded 160. Diyala was an al Qaeda stronghold until 2008, when Iraqi security forces, backed by U.S. troops, conducted major military operations in the province to push the militants out. Awakening Councils also played a major role in hunting down al Qaeda fighters in the province. Awakening Councils, whose members are predominantly Sunni, have been recruited by the U.S. military to work against al Qaeda in Iraq and other militias. Key security ministry positions remain vacant in Iraqi Prime Minister Nuri al-Maliki's government amid political wrangling. Al-Maliki serves as acting defense, interior and national security minister.